1976 Fender mustang in lefty mode with maple board and original case. I prefer the short-scale and this bass is now mine. They are pretty rare in l/h so I grabbed it. 1976 Fender mustang in lefty mode with maple board and original case.I prefer the short-scale and this bass is now mine.They are pretty rare in l/h so I grabbed it.Love the tone. Congrats! ….but pictures or it didn't happen. I can't get the picture too load off my phone. 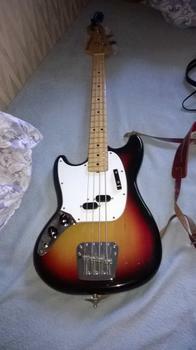 Its my first ‘proper’ bass, all I've owned before have been cheaper end made in China ones. my bass is very similar. but instead of a white trim, its got a black trim, and is a righty.